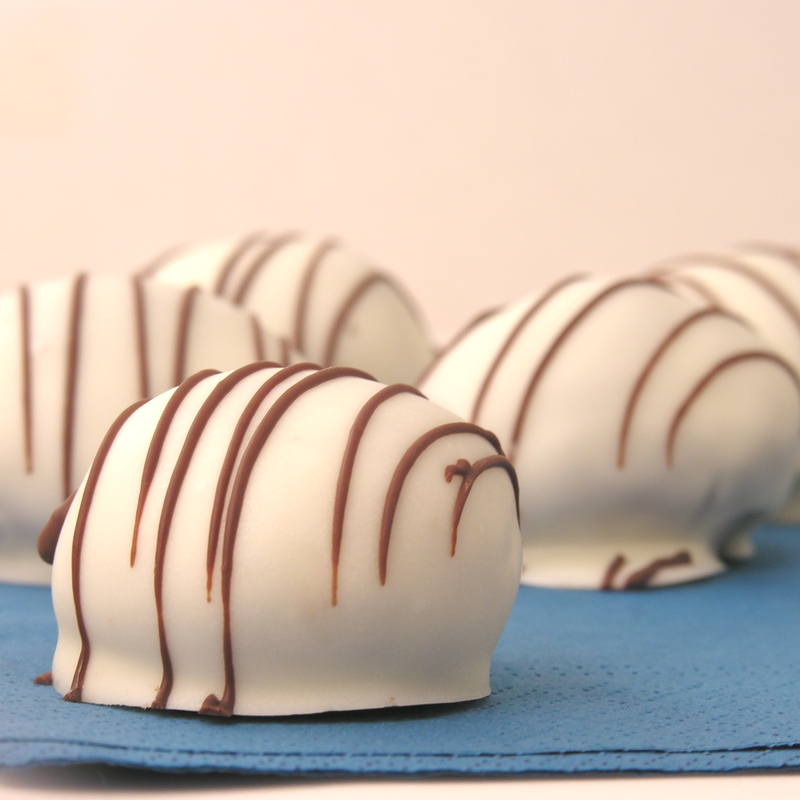 Red Velvet Cake Balls- filled with Cream Cheese Frosting! Surprise!!! 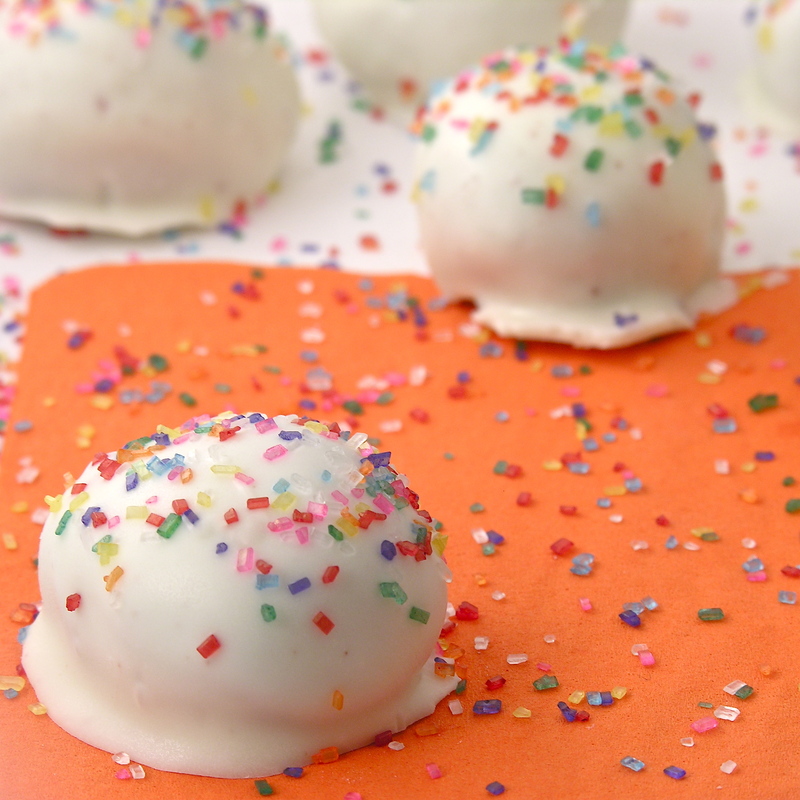 These red velvet cake balls are filled with cream cheese frosting! A fun treat for birthdays, holidays, showers….it is all in the decorating! One tub of ready-made cheesecake frosting. Sprinkles or dark chocolate candy melts to use for decorating. While cake is baking/cooling- spoon 1/2 of the tub of frosting into a ziptop bag. 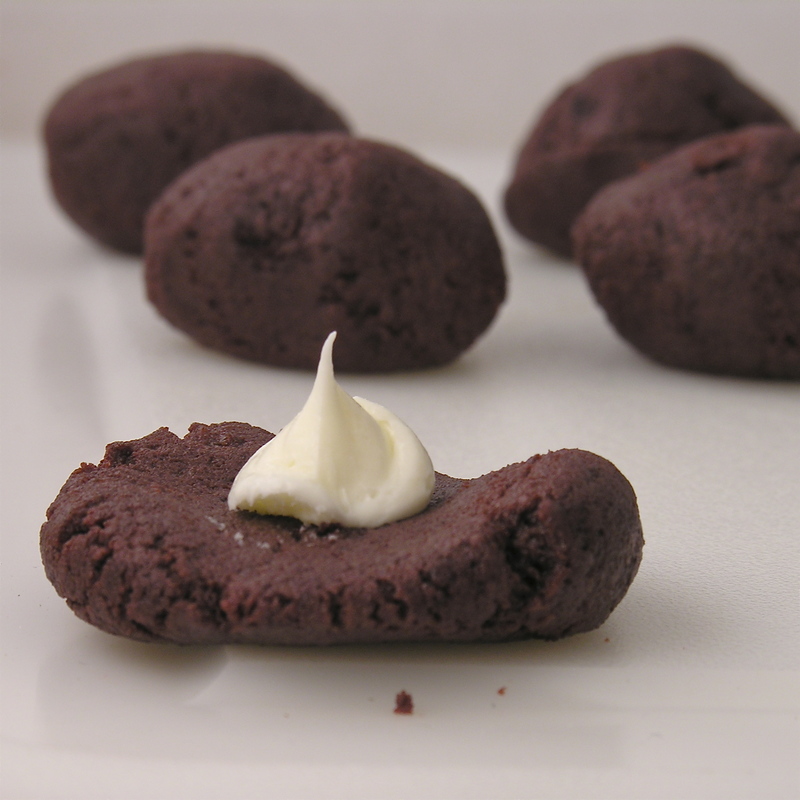 Clip a corner and pipe dime-size dollops of frosting onto a cookie sheet covered in parchment paper (pipe about 35-40) Place in freezer. Cut cooled cake into pieces and chop into fine crumbs using a food processor or food chopper. Mix cake crumbs with remaining frosting until it can be formed into balls that hold together (you may not need all the frosting). Roll about one tablespoon of cake into a ball, press it flat and put a frozen frosting bit in the center. 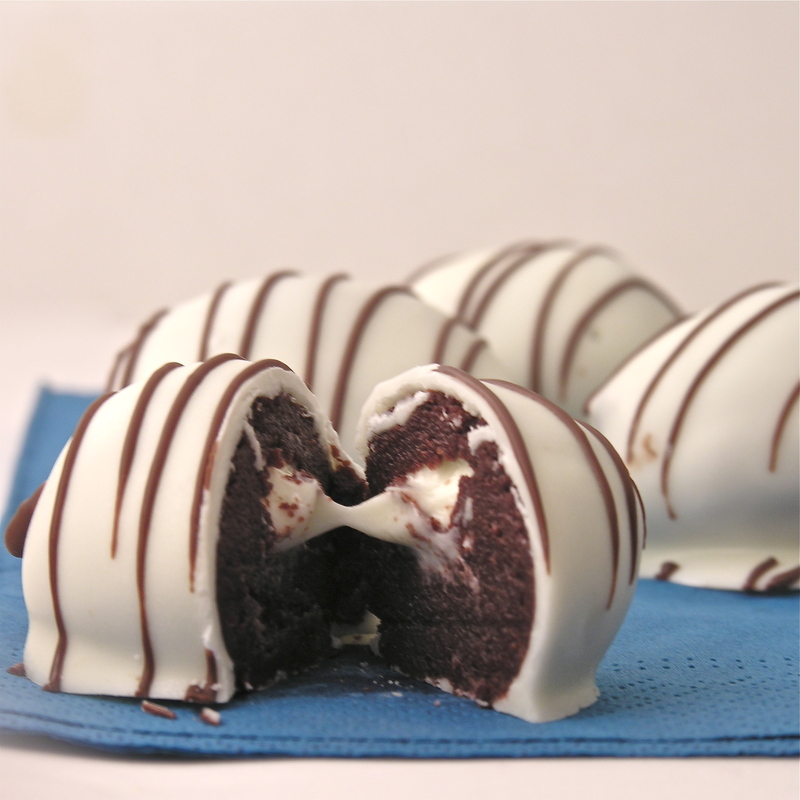 Wrap cake dough around frosting and smooth into a ball. (try to keep the frosting bits frozen- I did only 5 at a time and kept the rest in the freezer. 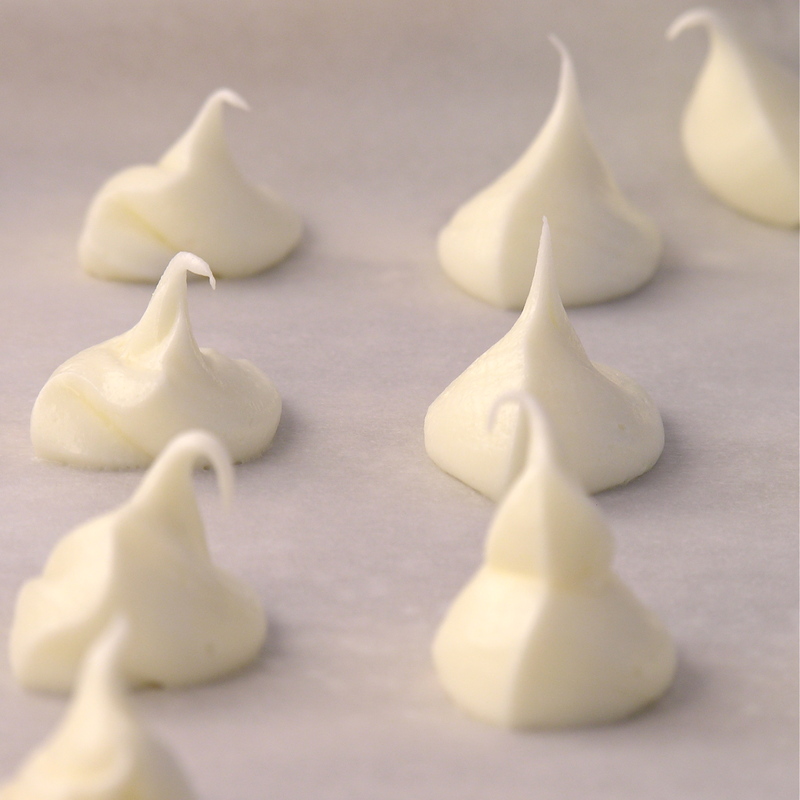 The frosting will not freeze hard- it will be more like taffy when you peel it from the parchment paper). Refrigerate cake balls for a few hours. Melt Candy Melts in microwave in 30 second increments until smooth. My thoughts: These are SO good. 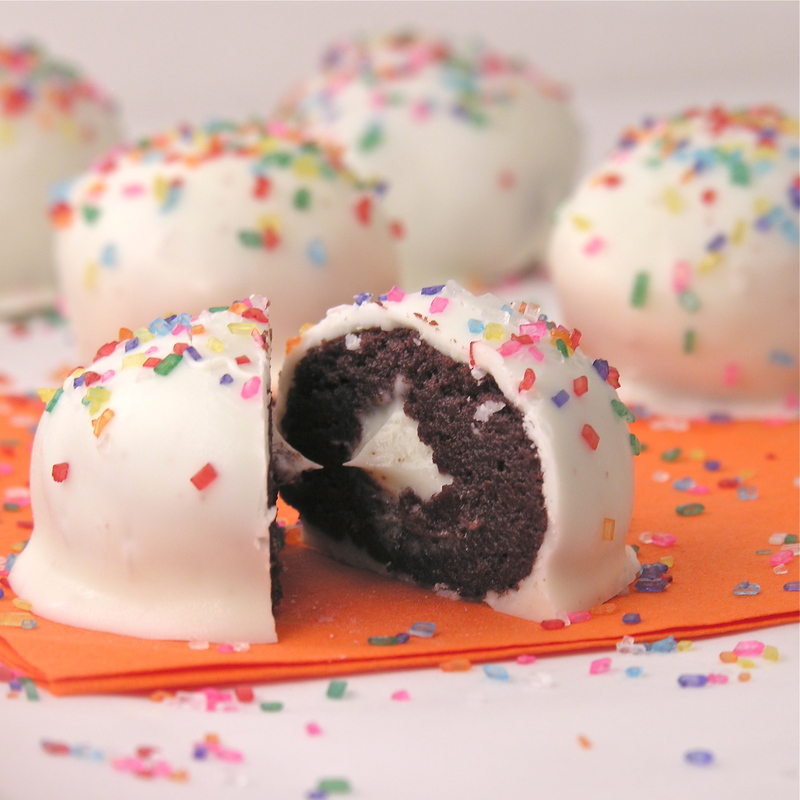 The frosting in the middle is a fun surprise and it adds a yummy creaminess to the cake balls. Hassle? Yes. I am convinced that cake balls and cake pops are not my gifting– so many people make them look effortless and that is NOT the case for me! I love the taste though….so once in awhile….ENJOY!!! Posted in Cake Pops, Candy and tagged baking, cake balls, cake pops, cream cheese frosting, cream filled cake balls, creative desserts, fancy desserts, party desserts, red velvet cake balls. Bookmark the permalink. These are sooooo pretty! I could do well with a few right about now! I’m on a diet too! Hahaha but these are so tempting man. Whyyyy??!!!! Lucky folks who get them tomorrow. Ooooh!!!! They look yummy!!! Love the pics, by the way! We haven’t tried cake pops. Hope it was a fun experience. I eat and enjoy anything red velvet…period. Great Blog! Your photos are Fab and the step by step is just beautifully done! Thanks! That is amazing! I’ve never seen anyone else do a center with cream cheese frosting before! Such a wonderful idea! Thanks so much! I want to try it with other frosting flavors/colors. A friend suggested it as a gender reveal dessert and I thought that sounded fun too. We had red velvet cake balls for our wedding. So delicious!!! I am in the process of making your recipe now. I will let you know how it goes!! Fun! I hope you just love them! I’d keep them in the fridge- just to help them hold together a bit better. Oh several days at least. I bet they’d even freeze, but you’d have to experiment.